Aran Island, also known as Aranmore with its lighthouse (originally of 1798, but replaced in 1865) on its north-west point, is visible for 25 miles. 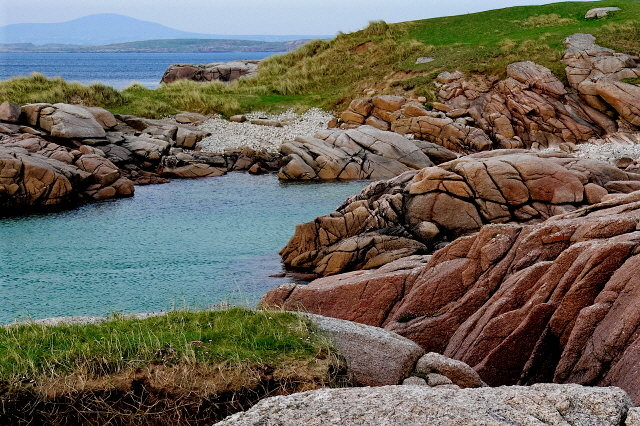 There is a regular ferry between Burtonport and Leabgarrow on the island, which, like the smaller islets of Inishcoo and Eighter, has good sandy beaches. There are fine views from the highlands of Aranmore back over the low-level coastline. The land is open and boggy with the villages (and the pubs) on the south and east of the island. From Burtonport the coast road bears north across an area known as The Rosses, well described by the naturalist Lloyd Praeger (1865-1953) as ‘a land of innumerable lakelets, a windswept heathery region, with small peaty fields grudgingly yielding difficult crops of potatoes and oats and turnips, and roads meandering through granite hillocks’. The road passes the offshore island of Cruit, and beyond, Inishfree Bay, before turning inland through Annagary to regain the main road at Crolly. Bunbeg is a little port, further north along the coast. Beyond, Derrybeg, on the coastal slopes, are the numerous houses and cottages, typical of the ‘Congested Districts’. You shortly round the hill known as Bloody Foreland (so-called from its red hue when lit up by the setting sun) the most northwest point of Donegal mainland. Aran Island is a hidden gem that is worth a visit on your Ireland tours.